It's the people of the Saugatuck-Douglas History Center that make it all work. With support through membership and contributions of time, talent and funds, we can continue this work and thrive. 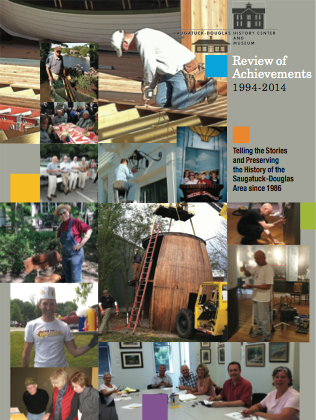 It's membership, sponsorship, volunteers and donations of cash and objects that help the Saugatuck-Douglas History Center keep history alive. Take a look at our Achievments Brochure to see just how much we've accomplished in our first 20 years. Your membership supports our exhibits and educational opportunities which contribute the health of our tourist-based community. The History Center is a not-for-profit 501(c)3 organization with membership open to all. We are a largely volunteer organization and dozens of folks find wonderfully gratifying ways to participate. There are opportunities to volunteer to fit any schedule, age, or skill set. It's a great way to help and to make new friends. Sponsorships are available for Exhibits, Tuesday Talks, Monthly Meetings, Interns, the Back-in-Time Garden, Memorial Benches or to underwrite a project. We have great opportunities for partnerships including Individual gifts, Business underwriting, advertising and sponsorships, Grants, Events and Estate Gifts. Contact us for more information on Gifts or Sponsorship. Help us keep the history alive with your generous, and tax-deductable, donations. Click the button below to make a cash donation to the History Center through PayPal. Please note that a PayPal account is NOT necessary. You'll see a link to use any one of several popular credit cards. We are often offered donations in the form of objects for inclusion in the History Center's collection of historic items. The Center cannot accept unsolicited donations without first evaluating the object’s historical significance, condition, and ownership. In order to have your donation evaluated, please complete an Object Donation form.